I even outlined several specific scenarios where that might occur, including giving the politicians more money in exchange for a flat tax or giving them additional revenue in exchange for real entitlement reform. But I then pointed out that all of those options are unrealistic. And I’ve expanded on that thesis in a new article. Here’s some of what I wrote for The Blaze. The no-tax pledge of Americans for Tax Reform generates a lot of controversy. With record levels of red ink, the political elite incessantly proclaims that all options must be “on the table.” This sounds reasonable. And when some Republicans say no tax hikes under any circumstances, there’s a lot of criticism about dogmatism. Theoretically, I agree with the elitists. So does that make me a squish, the fiscal equivalent of Chief Justice John Roberts? Nope, because I’m tethered to the real world. I know that there is zero chance of getting a good agreement. 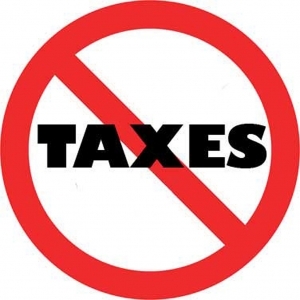 Once you put taxes “on the table,” any impetus for spending restraint evaporates. But even though I’m theoretically open to a tax hike, I am a de facto opponent of tax increases for the simple reason that we will never get a good deal. We won’t get sustainable spending cuts. Not even in our dreams. We won’t get real entitlement reforms. Even if we hold our breath ‘til we turn blue. And we won’t get the “Simpson-Bowles” tax reform swap, where taxpayers give up $2 of deductions in exchange for $1 of lower tax rates. Let’s not kid ourselves. In other words, reality trumps theory. Yes, there are tax-hike deals that would be good, but they’re about as realistic as me speculating on whether I’d be willing to play for the New York Yankees, but only if they guarantee me $5 million per year. I then point out that a budget deal inevitably would lead to bad policy – just as we saw in 1982 and 1990. Here’s the bottom line: There is no practical way to get a good deal from either the Democrats in the Senate or the Obama Administration. Notwithstanding the good intentions of some people, any grand bargain would be a failure that leads to higher spending and more red ink, just as we saw after the 1982 and 1990 budget deals. The tax increases would not be relatively benign loophole closers. Instead, the economy would be hit by higher marginal tax rates on work, savings, investment, and entrepreneurship. And the entitlement reform would be unsustainable gimmicks rather than structural changes to fix the underlying programs. Ironically, when a columnist for the New York Times complained that Republicans were being unreasonable for opposing tax hikes, she inadvertently revealed that the only successful budget deal was the one in 1997 – the one that had no tax hikes! The last sentence is worth some additional commentary. As I explained in a previous post, the only bipartisan budget agreement that generated a balanced budget was the 1997 pact – and that deal lowered taxes rather than increasing them. Some people try to argue that Bill Clinton’s 1993 tax hike deserves some of the credit, but I previously showed that the Administration’s Office of Management and Budget admitted – 18 months later! – that the nation would have triple-digit budget deficits for the foreseeable future. What changed (and this is where Bill Clinton deserves credit) is that the nation enjoyed a multi-year period of spending restraint in the mid-1990s. And when policy makers addressed the underlying disease of too much government spending, they solved the symptom of red ink.